Coppersmith Creations is proud to have its products featured in the March 2017 issue of the Inside Track Magazine. We are featured on page no. 19. We have a wide range of product offering ranging from copper bathtubs, copper sinks, copper kitchen sinks, copper beverage tub, lamps, faucets, and handicrafts. The snapshot below shows the page number 19 of this magazine with a spotlight article on our products. Congrats!! I am already using some of the above copper products.Apart from its beauty, I am enjoying it’s health benefits as well. they are truly worth your money. 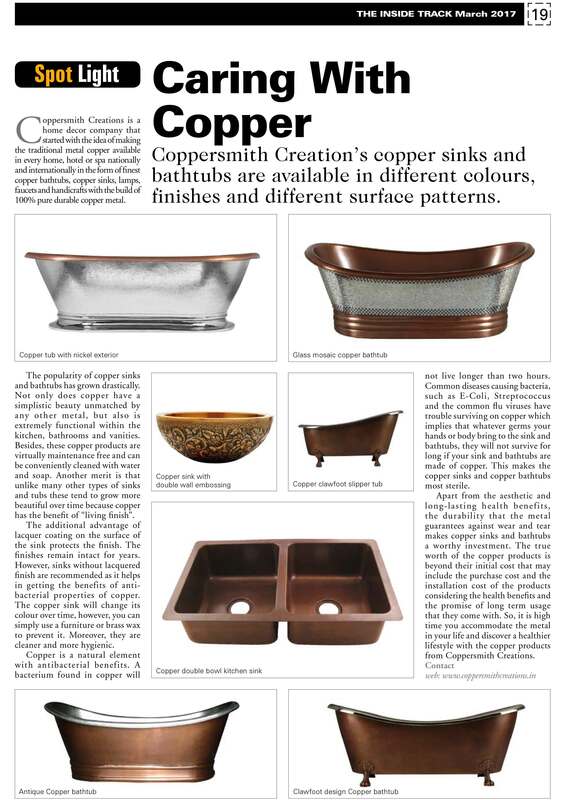 I must compliment Coppersmith Creations UK team for offering me their copper bathtub which I need and I must say that I am very much satisfied with the quality. The COPPER BATHTUB which we are looking for and that too in our budget I will be going to recommend my friends to your products. They are the best in their industry.I am using their bathtub for last 15 years.We are very pleased with the quality. I wish to congratulate Coppersmith Creations for the genuine and bona fide products with beautiful and aesthetic craftsmanship. I switched to ayurvedic lifestyle 6 months back and their copper jugs and glasses have been used by my family for drinking water. I can feel the difference and am sure will lead to health benefits for my family in long run. I would happily recommend its products for their authenticity and trust worthiness. Excellent range of products. I am already using some products and cherishing the health benefits apat from its beauty. Congratulations to the team ! Congratulations to Coppersmith Creations for being vouched by an independent internationally acclaimed source – Inside Track. This is an acknowledgement of your commitment to create high quality, innovative products. I highly recommend your products for their aesthetic value and high quality. Congratulations to a dedicated team of coppersmith creations and mentor! They r doing the great work indeed. Their products r amazing. Keep doing good work team!